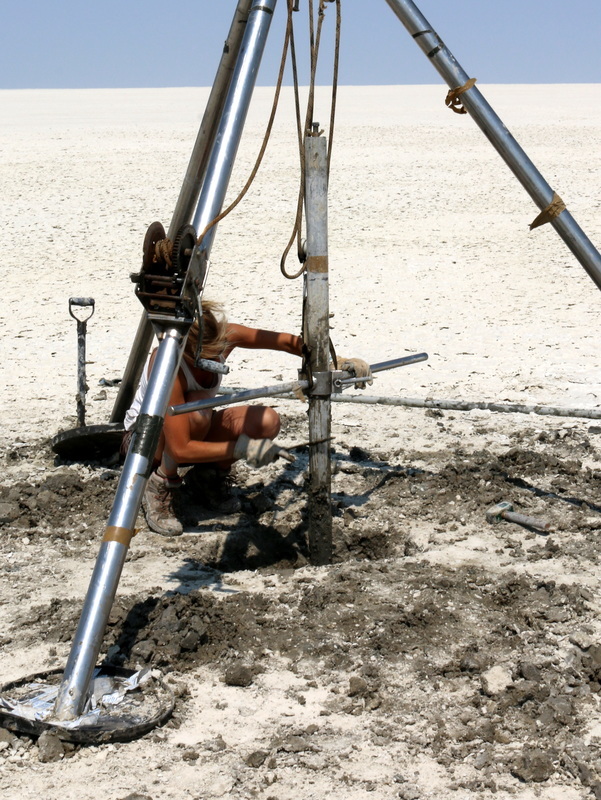 Sampling lake muds using a vibracorer in the Makgadikgadi salt pans, Botswana. Ancient lake systems, some of which now form the worlds largest salt pans, encode enormous quantities of information within the sediments they accumulate during wetter times. Earth Scientists use these sediments in a multitude of different ways, from the landscape scale to the molecular level, to 'see' thousands of years into the past and to understand how, when and why these environments differed from today. In desert regions, where organic sedimentary archives are often rare, these deposits and the palaeo-records they provide are particularly important. They have been used to answer fundamental questions about what drives the climate system; how great the amplitude of environmental change has been and where we currently lie within that envelope of climate variability. We can learn how both vegetation and the landscape responded to wetter and drier times and indeed what this tells us about how they might respond in future. Used in conjunction with climate models, the information locked up in lake mud allows us to test competing hypotheses about how the climate has behaved in the past and, in turn, helps us improve these models so that we might use them to better predict the future. The Makgadigadki saltpans, located in Botswana in the middle Kalahari, occupy a basin once filled by one of Africa's largest lakes. Deprivation of the inflow with changing river orientation slowly dried out the lake but evidence suggests that even since this time the lake has returned on several occasions during the last 200 thousand years driven by particularly wet phases in Africa's past. 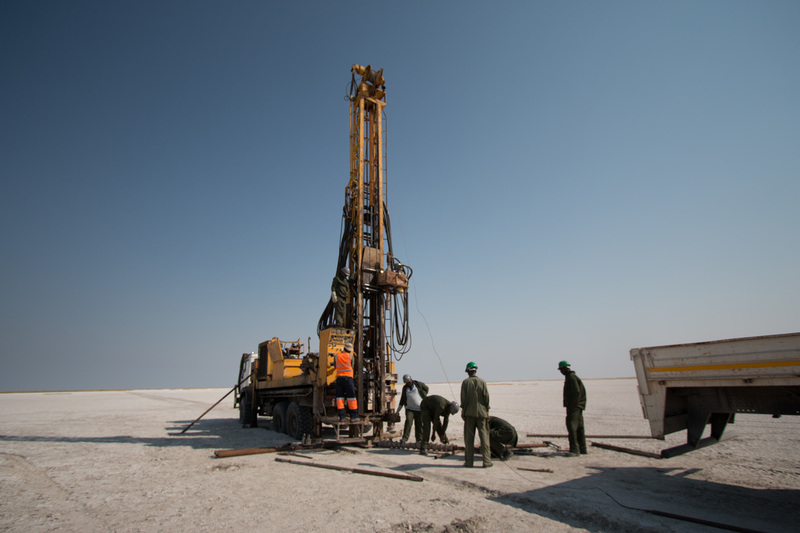 This research examines the potential of sediment cores, drilled from the lake bed, to reconstruct rainfall patterns and ecosystem responses in central Southern Africa, a region which lacks good records on past climate conditions. Supported by a National Geographic Global Exploration Award and in collaboration with the Geological Survey of Botswana & Dr Jess Tierney at the University of Arizona. ​How did major hydrological shifts affect Stone Age environmental use in the late Quaternary? For many years, we have known the Kalahari holds a rich record of human history. 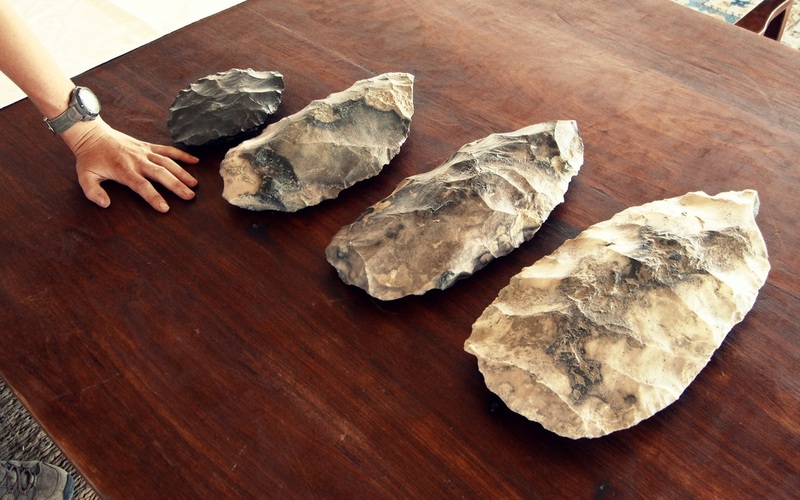 This project is systematically investigating the Stone Age archaeology of the Makgadikgadi basin and its relationship to the landscape evolution of the Okavango-Makgadikgadi system. ​The goal is to classify, characterise and date the abundant stone age archaeology (palaeolithic) scatters associated with the megalake system. We are also using geochemical data and a database of silcrete outcrop geochemistry to investigate the source location of the stone tools; and determine whether and how the prevailing environmental conditions impacted human use of the landscape. Funded by the Leverhulme Trust and in collaboration with the National Museum and University of Botswana, Prof David Thomas, Prof David Nash, Prof Sheila Coulsen and Dr Sigrid Staurset. Better predictions of future climate change and its environmental consequences in Africa can only be achieved with better climate models. The goal of this project is to improve the robustness of future climate projections for Africa through better representation of surface hydrology in the latest state-of-the-art UK Earth System Model. The idea is to produce an ESM that can dynamically form lakes and wetlands over Africa and which interacts with the wider climate system. We will test (1) whether surface hydrology feedbacks are critical amplifying factors of hydroclimate change, (2) whether feedbacks add complex spatial patterning and are therefore important for regional climate predictions, (3) how these feedbacks modify the inertia of the climate system to external forcing and (4) whether their inclusion can improve the representation of hydroclimate interannual variability. Funded by the Leverhulme Trust and in collaboration with Dr Joy Singarayer, Dr Simon Dadson, Dr Emily Black and Dr Charlie Williams. This is an international collaboration of scientists working together to pool expertise, skills and research approaches with the overall goal of improving our understanding of southern Hemisphere Quaternary dryland lake systems through data generation, synthesis, and methodological approaches. More than 35% of the southern hemisphere terrestrial landmass is covered by desert, with drylands occupying ~60%, ~75% and ~16%, of southern Africa, Australia and South America, respectively. These regions pose particular challenges for generating continuous and high resolution palaeorecords and suffer from a lack of information on past environmental change. Unlike temperate or tropical regions, high‐amplitude hydroclimate variability including frequent drying and desiccation of sediments can result in discontinuous deposition, incomplete preservation (particularly of organic material) and the overprint of post‐depositional processes. Nevertheless, researchers are increasingly finding new and innovative ways to tease out the hydroclimate records of long term change from dryland lake basins and where efforts have been made to access these archives they have become extremely important for our understanding of large‐scale shifts in climate at regional and continental scales.. When full, these palaeo-lakes would have constituted some of the largest lakes on earth, with surface areas significant enough to modify regional climate and ecosystems. Reconstructing and understanding the dynamics of these lake systems is therefore critical for understanding the nature, amplitude and frequency of change in southern hemisphere deserts and the climate systems with which they interact.